This Taylor Acoustic Guitar suffered a broken headstock. It happened while it was still in its case! 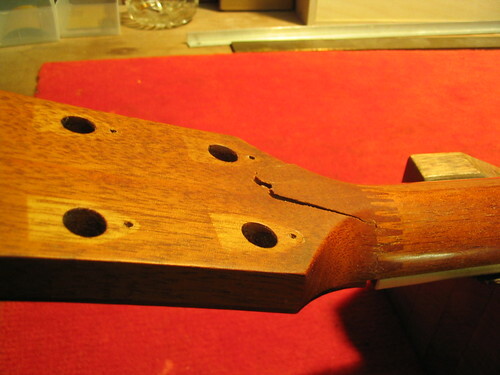 I think the problem was in the way the headstock and neck join were manufactured. If you look closely at the first photograph you will see that the neck and head are joined using a combing joint. In addition to the split across the head the combing joint looked very suspicious. This meant that the neck and head join would need reinforcing.